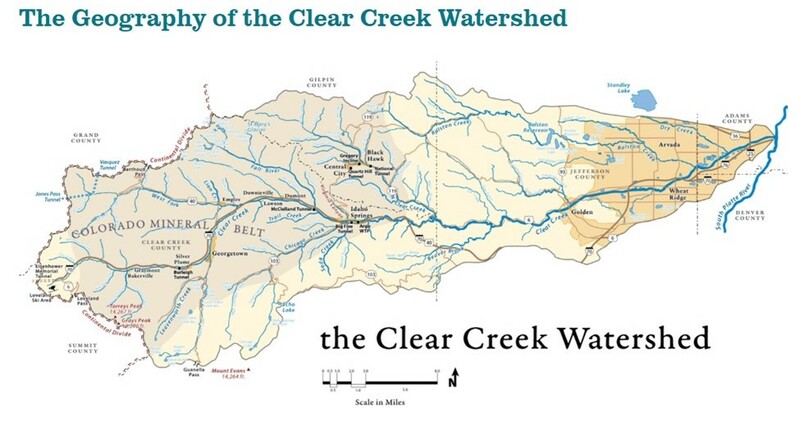 Incorporated in 1997, the Clear Creek Watershed Foundation (CCWF) was a non-profit organization dedicated to improving the conditions in the Clear Creek Watershed through comprehensive and cooperative efforts with watershed stakeholders. This includes, but not limited to, improving the water quality of Clear Creek and its tributaries. The efforts in promoting, coordinating and implementing projects—such as abandoned mine remediation, stream habitat improvement, outreach and education, alternative energy production, water conservation and reuse contributed to making Clear Creek and its communities a more sustainable watershed. After 22 years, the Foundation, attaining its primary mission, dissolved in 2019. “The Foundation has always been a vehicle to get projects done; it’s not an end in its own right. We’ve had a good beginning and middle. This is a good ending. We’ve made good progress. We’re very pleased with our record of success. The 575-square mile Clear Creek Watershed spans from 14,000-foot mountain peaks at its western edge on the Continental Divide down to the urbanized plains at its confluence with the South Platte River just north of the mile-high city of Denver. 400 square miles of that total are located in the mountains west of Golden. Fully one-third of the watershed lies within the Arapaho & Roosevelt National Forests and is administered by the Clear Creek Ranger District. Such a locale makes Clear Creek a prime model of an arid mountain west watershed. Cutting through the Colorado Mineral Belt, the upper portion of the Clear Creek Watershed is a “target-rich” environment full of inactive mines and naturally-occurring mineral sites. As a “Good Samaritan” entity authorized in a 2003 EPA Action Memo, CCWF conducted, facilitated and expedited cleanup of the 1,600 or so remaining inactive mine/mill sites not listed as priorities in the Clear Creek/Central City Superfund Operating Units Record of Decision (ROD). Clear Creek Watershed Foundation participated in over twenty water quality projects between 2004 and 2014. Click on the project links below to see a summary of each project. Projects are organized by geographical area. To see how each site relates to the others, refer to the above map.